Kira Danner is a lawyer in Florida but she just can't seem to get the fulfillment from her job that she craves. Her husband Peter has a fledgling IT business that he just can't seem to get off of the ground. When Peter's flighty brother Rand calls and offers them the opportunity to run a bed and breakfast in Vermont with himself and his wife for a year, Kira thinks that perhaps this will be the fresh start that they both desperately need. Rand's wife Alyssa has enjoyed the time that she has spent travelling around the world with him. Their marriage has, thus far, been spontaneous and carefree. She views running the B&B as just another adventure in a string of adventures and she is up for the challenge. Most of all, Alyssa hopes to come to terms with the fact that she has discovered that she is unable to bear children, a fact that has crushed her more than even her husband knows. Soon after their arrival in Vermont the sisters-in-laws, who are virtually strangers to one another, find themselves preparing for an over-the-top winter wedding as well as dealing with a demanding bride. When newcomer Dawn shows up on the scene, clearly emotionally wounded and in need of a safe place to stay for a while, the women find themselves welcoming her in to their increasingly dysfunctional fold. The women quickly learn that Dawn is not the only one running from something in their past, and that in fact all three of them have personal hurdles to overcome. 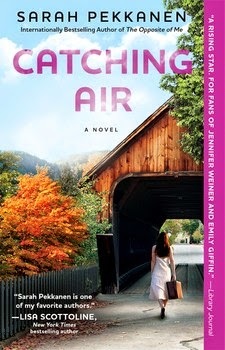 I love the fact that Sarah Pekkanen decided to feature three strong female characters in Catching Air. The three women may not be aware of their own inner strength in the beginning of the novel, but it quickly becomes apparent that these women are not pushovers. I also enjoyed the development of a relationship between sister-in-laws Kira and Alyssa. Although the two are so different- Kira is organized and efficient and Alyssa exotic and adventurous- they manage to form a bond with one another that surprises them both. I always look forward to reading Sarah's latest novels and Catching Air did not disappoint! Strong, well-developed characters leapt off the pages, the setting was vivid and descriptive, and I found myself unwilling to put the book down. I highly recommend Catching Air to current fans as well as to new ones, and I think that this would make a great book club selection! My thanks to Atria Books and Netgalley for the review copy. I have still to get to this author. I have had her on my TBR for ages. All of her books are really, really good, Mystica! She is definitely one of my favourite authors, hands down!